Collingwood and Essendon have enjoyed a massive rivalry on ANZAC Day since 1995. It has been one of the healthiest rivalries in football with the occasion often overshadowing the game. 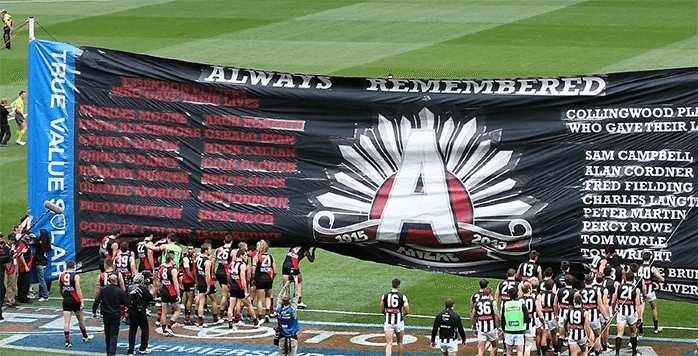 LET’S face it, the AFL has tried to introduce other ANZAC Day games over the last five years, but when footy fans think of Aussie Rules on our day of remembrance, it’s Essendon and Collingwood. The two teams rarely disappoint either, as some of the most memorable games in AFL history have been played on April 25. We took a look back through the years at some of our favourite ANZAC Day clashes and compiled a list of five of the best contests. With just under a week to go until the 2017 edition, will the Magpies extend their overall lead of 13 wins to five, or will the Bombers bury the demons of years gone by. Collingwood is the $1.78 favourite to defeat Essendon ($2.04) with Crownbet Australia. They say you need a game that leaves an indelible mark on the competition if your showpiece fixture is to survive, and the maiden Essendon vs Collingwood ANZAC Day clash delivered that in spades. In a back-and-forth contest Collingwood spearhead Saverio Rocca nailed a long range goal with just over a minute to go which levelled the teams on 111 points apiece, which was the final score of the match. It remains as one of the definitive matches in the heated Magpies vs Bombers rivalry and one of the greatest finishes in ANZAC Day football history. Collingwood had dominated Essendon for a long, sustained period on ANZAC Day, and in 2009 it looked like they would record another comfortable win over their counterparts. A certain youngster in black and red had other ideas. After going down by three scores late in the game, the Dons threw caution to the wind and drew within a kick after some daring run-and-dash play. The young midfielder kicked his first ever AFL goal in the final seconds to secure the memorable win for his side. To underline just how unlikely the victory was, watch the video below and listen the Triple M commentary. Even the experts were as incredulous as the fans. It was one of the great ANZAC Day finishes for Collingwood fans. The Magpies lead for almost the entire match, but a late flurry from the Dons put the red and black in front in the dying stages of the match through a Brent Stanton snap and it looked like the Bombers had pinched it. But the Pies were not done by any stretch. Just like Rocca in 1995, Blair nailed a goal with just 1.20 left on the clock, but this time it put his team in front. It is without question one of Collingwood’s best wins on ANZAC Day since the game’s inception. Mark this one down as a moment of the most unlikely. Collingwood were hot favourites heading into the 2014 edition of the big fixture, but the Dons got the jump on the Pies, holding a six goal lead early in the contest. The Magpies never panicked and continued to chip away at the margin until they took the lead early in the second half. The Dons battled back and looked like they could claim the win, but the Pies rallied to run out convincing 23-point winners in the greatest comeback in ANZAC Day history. After their famous 2009 Anzac Day win, the Bombers went through a dry spell on Australia’s famous day. That all changed on 2013. After taking a strong lead in the third quarter, Collingwood attempted to mount a spirited comeback on the back of a long-range Tyson Goldsack goal to start the last quarter. It was the Bombers who steadied, kicked away and recorded one of their finest ANZAC Day wins in recent memory. Four years on from his 2009 cameo that sealed the game, David Zaharakis played a defining role for his side, booting four goals to claim the ANZAC Day medal.